Deeplas and other key suppliers supported Frank Howard at the event held at the company’s Bishops Stortford branch. Following the signing of an agreement for an additional unit, adjacent to the existing shop on Links Business Park, Frank Howard has been able to significantly expand its Deeplas offering. Frank Howard stocks the full range of Deeplas products such as its premium quality fascia and soffit boards, along with Twinson® decking. It also stocks Deeplas cladding, architraves, angles and trims. During the customer event, the Deeplas team had a full range of products on display in the new warehouse as well as carrying out a series of product installation demonstrations that highlighted the benefits of its products to Frank Howard’s customers. 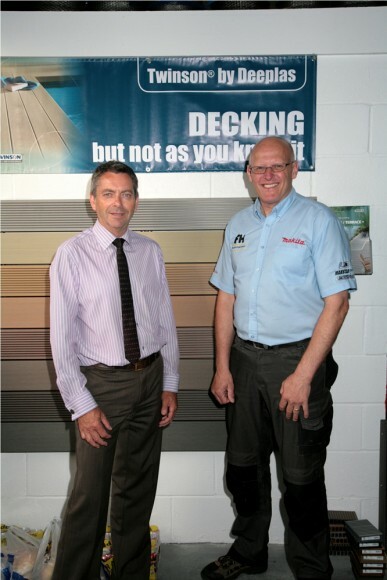 Frank Howard has seen a continual increase in sales of Twinson® decking over the last few months, whilst offering the full range of Deeplas products has helped win a number of new customers. Frank Howard also stock the full range of Deeplas products at their Head Office branch in Baintree, Essex, which has a purpose built warehouse and show room on Lakes Industrial Park. For more information about Frank Howard, visit: www.frankhoward.com or contact their customer service team on: 01279 506016. To find out more about Deeplas contact the Deeplas customer services team directly on 0800 988 7309.